In 1651, a highly unconventional Latin grammar was published in Gdańsk, Poland. Written in German by Johann Buno and entitled Neue Lateinische Grammatica in Fabeln und Bildern (A New Latin Grammar in Stories and Illustrations), the book includes ten extremely unusual grammatical engravings. Ostensibly designed to aid understanding and memorization, the engravings are richly detailed and include strange, exotic, and sometimes violent imagery. Be sure to visit the gallery to see all the illustrations and folding tables from this book. 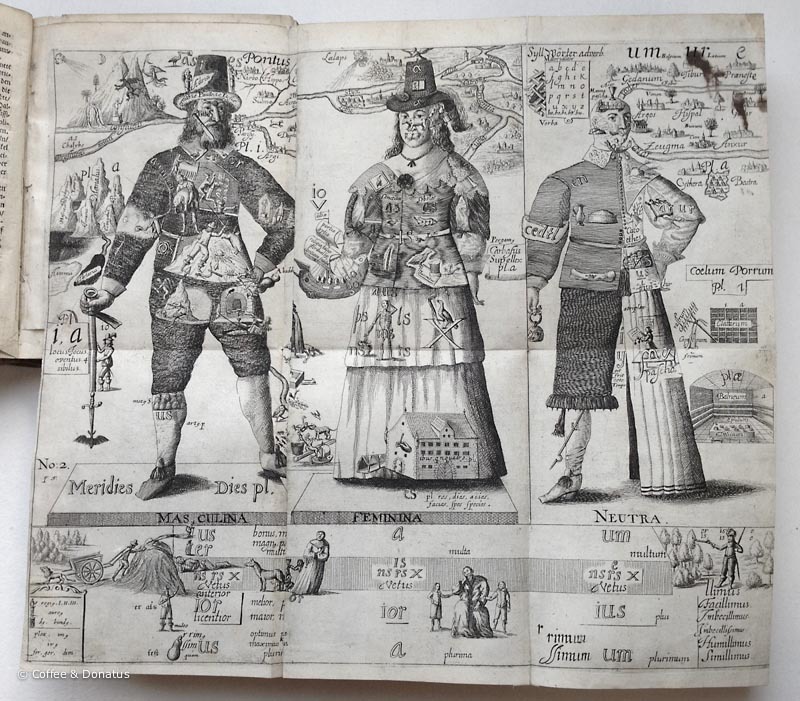 A large engraved fold-out illustration that includes an unusual depiction of grammatical gender. From Johann Buno’s “Neue Lateinische Grammatica in Fabeln und Bildern,” 1651. Actual size: 374 mm x 310 mm. 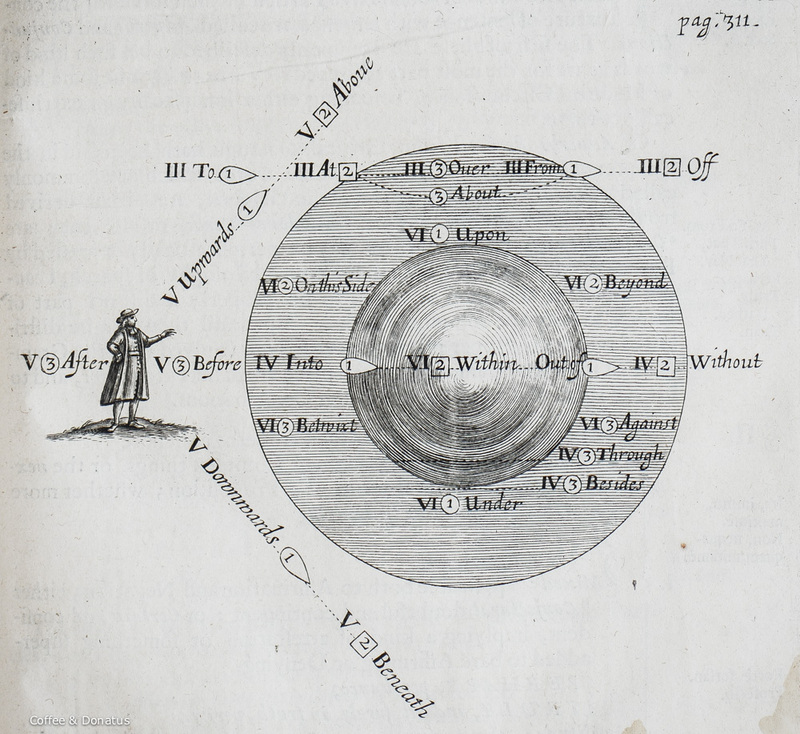 While the 17th century was a time when educational innovators like Johann Amos Comenius and others were experimenting with pictorial teaching methods, surprisingly few grammars of that era employed images or diagrams to any great extent. A number of language learning books like primers and vocabularies included illustrations to aid memory, relate words to recognizable physical objects, or impart moral lessons, but grammars of the day were generally more textual and less visual. One wonderful example of an early 17th century illustrated grammar is Tilmann Olearius’ Deutsche Sprachkunst (Halle: Melchior Oelschlegel, 1630). This modest little book cleverly incorporates a variety of simply drawn woodcut illustrations to help convey its grammatical points. For example, on the page talking about the present tense, there is a standing man who looks to be reading a broadside, and for the future tense, the illustration is of a kneeling man who looks to be praying for future salvation (or something like that). All things considered, Olearius’ book is still more the exception than the rule. Whether you’re talking about 17th century grammars in general, or illustrated grammars specifically, Buno’s Neue Lateinische Grammatica is an anomaly. Its engraved illustrations are richly detailed, often grand in scale, and include imagery that is not only strange, but breaks with reality as though it was something from the mind of the surrealist Salvador Dali. Compared to its contemporaries, the illustrations are also seemingly more deliberate in their attempts to visually express grammatical concepts and relationships, rather than merely offering a memory aid or a pretty picture. Title page from Johann Buno’s “Neue Lateinische Grammatica in Fabeln und Bildern,” 1651. Born in Germany, Johann Buno (1617-1697) was variously remembered as a Lutheran clergyman, scholar, and educator. He studied at Marburg and Helmstadt and later spent some years in Gdańsk, where this book was published. Buno was also the rector of prestigious St. Michael’s School in Luneburg for 43 years (1653-1696) where he taught geography and history. As early as 1647, he was apparently experimenting with the use of imagery to aid memory and help students learn more effectively. In his later works, Buno also applied his visual methods to the teaching of law and history. The 1651 edition was the only edition ever published. It was printed by Andrzej Hünefeld, a German-born printer, living and working in Gdańsk. Perhaps not surprisingly, Hünefeld is also known to have printed the works of Comenius. 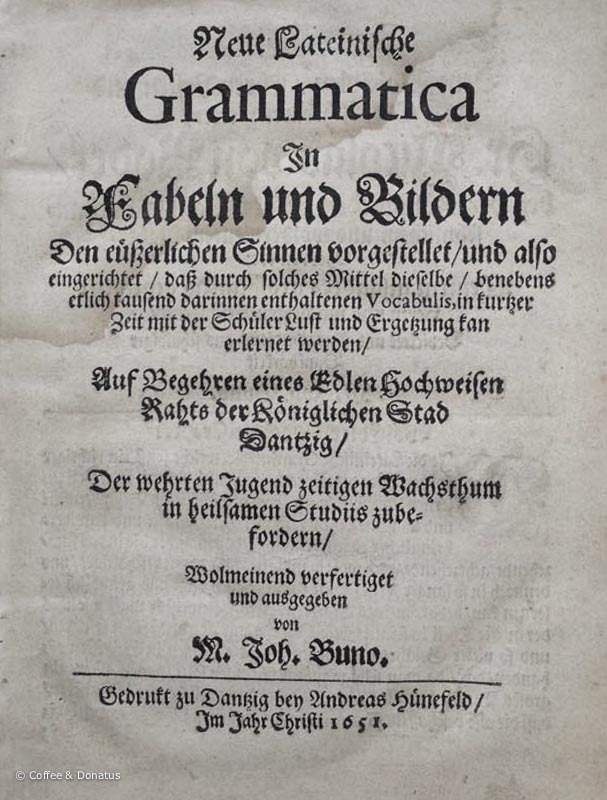 Buno did write an earlier grammar in 1650 entitled Vralter Fußsteig der Fabular und Bilder-Grammatic (Ancient Footpath of Stories and Illustrated Grammar). Despite the title, the book is not illustrated and is considerably shorter. It just so happens to be bound with the copy of the book pictured in the photographs. 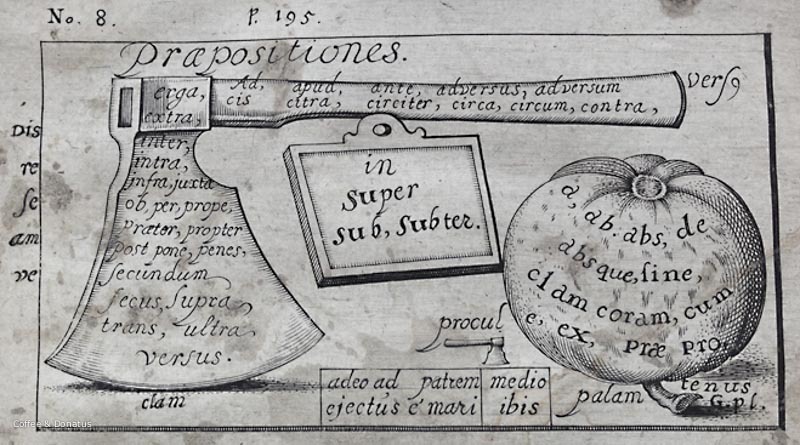 It’s interesting to note that Buno’s illustrated grammar predates Comenius’ Orbis Sensualium Pictus (Visible World in Pictures) by seven years. Published in 1658, Comenius’ book was widely imitated, reprinted in countless editions, and often credited with popularizing pictorial teaching methods. Janua Linguarum Reserata, a popular tri-lingual grammar by Comenius, was published in 1631, but the book was not illustrated. John Wilkins’ universal grammar, An Essay Towards a Real Character And a Philosophical Language, was extensively illustrated and included interesting depictions of grammatical concepts (see one from our gallery), but this book did not appear until almost twenty years later (1668). Johann Buno is the younger brother of Conrad Buno (ca. 1613–1671), a well-known engraver and cartographer. Conrad Buno is known for his important set of engraved maps included in the 1641 edition of Philipp Clüver’s famous work on geography entitled Introductio in Universam Geographicam. Interestingly, Johann Buno wrote the text for this particular edition. Given the family ties, it would not be surprising if the engravings in Neue Lateinische grammatica were the work of Conrad. Small illustrated diagram discussing prepositions. From Johann Buno’s “Neue Lateinische Grammatica in Fabeln und Bildern,” 1651. Actual size: 126 mm x 70 mm. Neue Lateinische grammatica in fabeln und bildern den euesserlichen sinnen vorgestellet/ Und also eingerichtet, dass durch solches mittel dieselbe/ Benebens etlich tausend darinnen enthaltenen vocabulis, in kurtzer zeit mit der schueler lust und ergetzung kan erlernet werden/ Auf begehren eines edlen hochweisen raths der koeniglichen stad Dantzig/ Der wehrten jugend zeitigen wachsthum in heilsamen studiis zubefordern/ Wolmeinend verfertiget und ausgegeben von M. Joh. Buno. Gdańsk: Bey Andreas Hünefeld, 1651; , 244 p.; 19 cm. ; 4to: a-f4, g2, A-Z4, Aa-Gg4, Hh2. 148 leaves, 10 engraved plates, 2 folding tables. g-g2 and Hh-Hh2 lacking, but replaced with early manuscript. First and only edition. Gdańsk: Gedruckt bey seel. Georg Rheten Witwe, 1650. , 64 p.; 4to: )(6, A-H4. 38 leaves. First and only edition. Special thanks to Dr. Allen Viehmeyer for his kind assistance translating the German.